Last year Springfield Armory introduced an upsized version of its successful 9mm EMP (Enhanced Micro Pistol): the EMP 4 Lightweight Champion. And now it's brought out what amounts to a "factory custom" version of that model: the EMP 4 Lightweight Champion with Concealed Carry Contour.Before we dive into the details of this specific model, let's review how the EMP differs from the "standard" 1911. It does—and yet it doesn't. Let me explain. The 1911 was built around the .45 ACP cartridge. That means it's a gun designed not only to handle the recoil of that cartridge but also designed to fit, feed and function with a cartridge the length and width of a .45 ACP. For years, Gunsmiths and companies have been producing 1911s chambered in 9mm, but getting those pistols to operate reliably with the smaller, shorter cartridge has taken serious work. It has required modifications not just to the pistol but also to the magazines—with uneven results. The engineers at Springfield Armory decided to go back to the drawing board with the Enhanced Micro Pistol to design a 1911 specifically around the 9mm cartridge, which is 1/8 inch shorter than the .45 ACP. That difference in length might not sound like much, but shortening the action makes the pistol proportionally smaller in every way—as well as inherently more reliable than a full-size 1911 chambered in 9mm. The original EMP was built as a concealed-carry gun with a three-inch barrel and short aluminum frame. In addition to the 9mm it was also chambered to the .40 S&W, a cartridge with the same overall length as the 9mm. The EMP 4 Lightweight Champion featured a four-inch barrel and longer grip for increased capacity. The new EMP 4 Lightweight Champion with Concealed Carry Contour (which is a mouthful, so we'll abbreviate as EMP 4 CCC for the rest of the article) takes that package and goes a step further. This new EMP features a four-inch stainless steel bull barrel with a fully supported ramp. Currently, it is only available in 9mm. It is a two-tone gun (Springfield prefers the term "bi-tone"), with a satin-finish stainless steel slide over a black anodized aluminum frame. Stainless steel and aluminum mean we don't need no stinkin' fancy expensive coatings to prevent rust. The end result with an empty magazine in place weighs 30.5 ounces—3.5 ounces more than the original EMP. This means the EMP 4 CCC weighs about an ounce less than a traditional 1911 Commander built on a lightweight frame. One of the most significant changes the EMP 4 CCC brings is the angled cut at the bottom of the frame, a modification that makes the gun even more concealable. that the edge of the frame where it met with the barrel's feed ramp was slightly beveled and polished as well. The original three-inch EMP had a dual recoil spring due to the light weight of the short slide. The EMP 4 CCC has an inch more meat up top, so it sports a full-length steel recoil spring guide rod around which is a single flat-wire recoil spring. The pistol also features a captive recoil spring plug, so to fully disassemble the pistol you'll need to stick a small pin or a paper clip through the hole in the side of the guide rod. "EMP 4," "9MM" and "SPRINGFIELD ARMORY" are attractively laser etched on the slide. Slide-to-frame fit was nice and snug with no play. There was no movement at all in the barrel with the pistol in battery. I found the disconnector to be a bit stiff against the slide, but that's pretty common in new, unfired pistols. The gun features a stainless steel bull barrel, and inside you'll find a full-length steel recoil spring guide rod. The front sight is a fiber optic. snugly into the beavertail, which has a hump at the bottom for more positive disengagement. The front and back of the frame have been treated to what Springfield calls its "Posi-Lock texturing pattern." For a few years, I've been describing patterns like the Posi-Lock as tactical golf ball stippling because it resembles the indentations you see on a golf ball. The texturing on the frame is rougher than the dimples on a golf ball, but it's less aggressive than checkering. The G10 grips feature the same pattern, except the edges of the dimples are significantly sharper. The end result is a pistol that won't move in your hand under recoil. There is a small relief cut on the left-side grip panel to make it easier to reach the magazine release. The magazine well has been nicely beveled to aid reloads. The magazines, purpose-built from the ground up, seem nearly as small as .22 magazines. They are made in Italy by Mec-Gar, the king of OEM magazines, have stainless steel non-tilt followers, and fit flush with the frame. The pistol ships with three nine-round magazines in a lockable case, a nice bonus. The reduced circumference of the EMP 4 CCC grip makes for a pistol that not only feels comfortably small in the hand, but also conceals well. Even short-framed and short-barreled 1911s can feel a bit chunky if you have small hands. The EMP is noticeably smaller in your hand and has a very nice weight-to-size ratio. The EMP 4 CCC sports a full-size ambidextrous thumb safety in addition to a beavertail grip safety with memory bump. The G10 grips have a small dish to make it easier to hit the mag release button. And not to bury the lead, but now we come to the feature that gives this new pistol its full name: Concealed Carry Contour. I'm not sure which gunsmith first cut the back corner off the frame of a 1911, but it removes a corner that pokes you in the palm and reduces the profile of the part of the pistol most likely to print under clothing. The longer frame of the EMP 4 provides enough real estate that you will be able to comfortably get all of your fingers on the gun, increasing comfort and shootability over the original EMP. Even though the frame on the EMP 4 is half an inch longer than the original EMP, with the Concealed Carry Contour it prints the same, or less, under clothing. This is the purpose of the frame cut, but as a result, the practical grip angle of the pistol changes slightly. The "grip angle" technically measures the angle of the grip in relation to the bore. In effect, though, it indicates where the barrel will be pointing when you present the pistol. 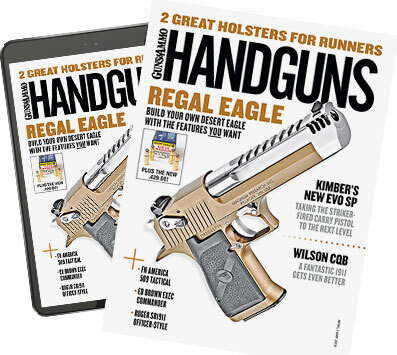 There is no standard regarding how and where to measure the grip angle on a handgun. However, because backstraps and grips have varying contours and angles, generally the grip angle of a handgun is calculated off the unchanging frontstrap (front of the gripping frame) of the pistol. This is pertinent because the first time I ever picked up a 1911 with a similar "bobtail" cut on the frame, I noticed the frame sat differently in my hand. Because the back corner of the frame was no longer pushing against my palm, it affected the angle between my hand and wrist when presenting the sights to the target—in effect slightly changing the grip angle on the pistol. I noticed this with the EMP 4 CCC as well. While the frontstrap of the EMP has the same angle off the bore as every other 1911, the practical result of the carry cut on the frame is to make the perceived grip angle slightly more vertical than with a standard 1911. Most people may not even notice the slight grip angle change, and I'm not saying it's bad or good; I just want people to be aware of it. Also, you might notice that the actual "cut" part of the frame is smooth as opposed to sporting Posi-Lock texturing. This is how you want it. This part of the frame is what is going to rub against your covering garment. Smooth metal here means not only will your covering garment not hang up on your gun, causing it to print, it will prevent the gun from eventually chewing through the covering garment. I've had that happen to me with a hand-checkered 1911. The EMP 4 CCC is a 1911, which means it has a single-action firing system. The hammer must first be cocked before the safety can be engaged or the trigger pulled. The trigger does not pivot but rather slides straight rearward. The trigger on the EMP 4 CCC is a longer model and skeletonized to help keep the weight down. Model 1911s traditionally have trigger pulls against which all other pistols are judged. The trigger pull on my sample was an unimpressive 5.4 pounds, with a bit of grit. Total trigger pull travel, including take-up, was less than 1/8 inch. For a realistic comparison, that means the "mediocre" trigger pull on my EMP was shorter, crisper and lighter than just about any striker-fired pistol on the market. This is why the 1911 after over a century is still one of the most popular handgun designs in America. The 1911 is an inherently safe design, with a manual thumb safety and a grip safety, both of which have to be disengaged before pressing the trigger will yield any result. The ambidextrous thumb safety on the EMP is the same size as on a full-size 1911. It is an extended model, with serrated paddles and positive clicks up and down, and it's easy and instinctive to work even under stress. This is, of course, important. Not to belabor the point, because most readers already know this, but for those who don't: The 1911 was meant to be carried "cocked and locked"—with a round in the chamber, hammer back and safety on. When you draw the pistol it is ready to go. And you ride the thumb safety with your thumb, with a "thumb-high hold" that helps control the gun while firing and prevents the thumb safety from accidentally being engaged under recoil. The original EMP can be a little jumpy with +P ammo. The EMP 4 with bigger grip and a little more weight was just fun to shoot no matter what I fed it. The new EMP 4 CCC, with its aggressive texturing, just doesn't move in the hand. Anyone should be able to shoot it as well as they can a full-size gun, even though it is eminently concealable. I believe the technical term for this situation is "best of both worlds." The gun ran just fine with every type of ammo I used. Between the 1911 trigger and the good sight radius, you'll be able to shoot just as fast and accurately as you need. It was just fun to run plate racks with this gun. The four-inch barrel means you'll get velocities out of your ammo close to manufacturer figures, which means improved terminal performance. Issues with the gun? Only one. Automakers spend millions of dollars with advertising, marketing and research companies to "imagineer" cool new memorable names for their cars: Ford Raptor, Chrysler Pacifica, Nissan Pathfinder, and so forth. Conversely, EMP 4 Lightweight Champion with Concealed Carry Contour doesn't exactly roll right off the tongue. And we didn't abbreviate it "CCC" on a whim; even some people inside the company simply call it the EMP 4 CCC. As for whether any other pistols in Springfield's line will be getting the concealed carry contour treatment, a Springfield representative told me there's nothing in the works right now, but the company is always looking at new items. So stay tuned.